CAVE-BEAST BEBOP with his BODACIOUS BRONTOSAURUS The Dino-zoic Demolition Duo VITAL STONETISTICS Accessories: Stick-em Stone Sword, Turtle Skull Pole, Battle Bones Saddle, Removable Reins, Broto Bran. . . 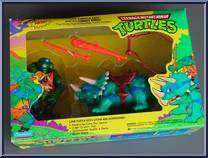 The Stone Age Collectible Turtle Combo! VITAL STONETISTICS: Accessories: Battlin' Bronto Bo, Mesozoic Mace, Turtle-Textured Saddle & Reins, Bronto Brand Favorite Food: Prehistoric Pizza Favor. 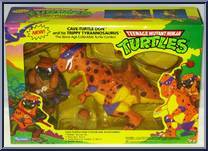 . .
CAVE TURTLE LEO & HIS DINGY DINO The First Collectible Turtle Combo! Cro-magnum crooks cram into the nearest cave when this prehistoric predator comes lumbering into view. He's a ferocious, fur . . . The Stone Age Collectible Turtle Combo! VITAL STONETISTICS: Accessories: Neanderthal Nunchaku, Way-back Whack 'em Axe, Turtle-Textured Saddle & Reins, Bronto Brand Favorite Food: Old Grisly Go. . . The Stone Age Collectible Turtle Combo! VITAL STONETISTICS: Accessories: Super Sedimentary Sai, Stick 'em Stone Spear, Turtle-textured Saddle and Reins, Bronto Brand Favorite Food: Tar Pit Pizza . 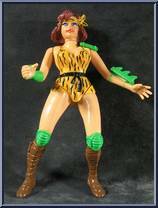 . .
CAVE-WOMAN APRIL and her RADICAL RAPTOR The Stone Age Rockin' Reporter and Dino Pal Combo! VITAL STONETISTICS Accessories: Kowabunga Club, Wood and Stone Ninja Stars, Stone Stickin' Knife, Stone Age S. . . The Stone Age Collectible Turtle Combo! Accessories: Kowabunga Cave Boy Katana, Critter Crushin' Club, Turtle-textured Saddle & Reins Favorite Cave: Cro Magnon Favorite Food: Brontosaurus Pizza W. . .